Trash and Treasure: Jeff Reviews....More Stuff and Stuff. - Wait, What? Welcome back to the latest installment of “Where Did The Time Go?” in which I rhetorically ask questions like “hey, where did the time go?” before admitting I barely made headway on my tall stack of pending books, and instead grabbed my iPad, made all kinds of impulse purchases, and then compulsively read them instead. After the jump: find out what I was reading in place of what I was supposed to be reading! I’m sorry, but this cover has everything awesome on it. 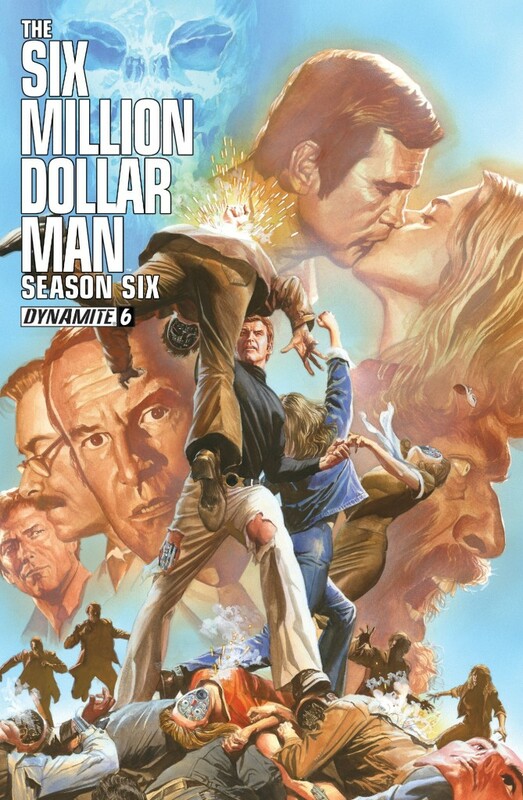 THE SIX MILLION DOLLAR MAN: SEASON SIX #1-6: Aw, man. I bought the first three issues of this back during a Dynamite sale on Comixology, liked ’em in a snarky way, and was pretty excited to see issues #4-6 pop up on another (much more recent) Comixology sale. Would there be more loving fan service for crotchety nerds like myself to simultaneously critique and admire? 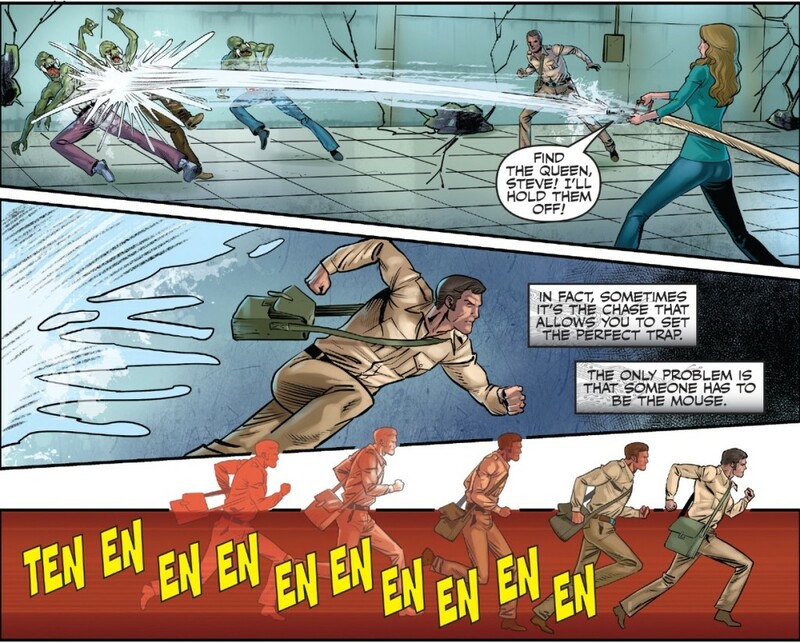 Would the bionic sound effects look just as generic and baffling in the first three issues? 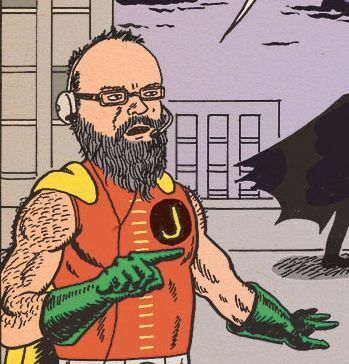 Would we get to see more script pages showing us how writer Jim Kuhoric gave elaborate panel layout suggestions for Juan Antonio Ramirez to ignore? And, most importantly, will Bionic Bigfoot pop up? The answers to those questions: Yes, nope, and kind of. One of the things that’s tough is Kuhoric paces this like he’s got a twelve issue series up his sleeve, so the Maskatron stuff moves from the “B” story to “A” story and back again with other alternating stories weaving in and out. So, on the one hand, while it’s great he’s milking at least two separate storylines from the show’s original Venus Probe episodes (also known as “the other awesome story from the original show”), one of them about a human turned creepy alien hybrid (that looks the winner of the Natasha Henstridge Species coloring book competition, in part because the entrant made it a point to use all the crayons) is a slow moving dud, an infection/invasion scenario that builds forever before being resolved in one underwhelming issue. As it turns out, it’s super-underwhelming because Dynamite stopped publishing the series after six issues (although they promise the book will return, presumably with a new first issue to goose sales), thus giving Kuhoric’s story that good ol’ “Wile E. Coyote confidently walks off into empty air” feeling. The crippled Russian General from the “Steve fights a Metal Gear” issue is melded to the Soviet’s Venus Probe for a rematch; Maskatron has made it out to the woods to hunt down Bionic Bigfoot; and the de-bionicized Barney has been rebuilt by a mysterious benefactor (who I think is supposed to look like Alan Oppenheimer, the actor who played Rudy Wells for the first few seasons before being replaced by Martin E. Brooks) with an entirely new body that makes him look like a de-helmeted Robocop. All of that is set up but, until the new issues come out, none of it pays off. I’m sure I’m part of the problem: if I’d been buying these off the rack at week of release, the book would be that much closer to profitable and there’d be no need for “reboot” shenanigans (or worse, “promising to return shortly and taking the back road out of town never to return” shenanigans). And if the series comes back, I could force myself to plunk down $1.99 for digital copies (the price these issues are right now at Comixology). But it’s tough. The book is all plot, and that plot is leveraged on fan service and in-jokes. Kuhoric is faithful to the personalities of the characters from the show, but unfortunately those characters don’t have personalities. Before we had bots, we had TV characters: even as Kuhoric does a great job, say, making Steve’s generic action hero personality seem like understated heroism, it doesn’t transcend the material, it suits it. As a disposable ninety-nine cent digital read, the book is fun. It feels like a dopey indulgence, something I don’t have to even worry about cluttering up a longbox with afterward. But I know I’d feel differently paying $3.99 for a print copy. Would I feel as charitable with a $1.99 digital copy? Let’s see if I have a chance to find out. People love Woodring’s Frank stories–the wordless adventures of an anthropomorphized unidentifiable animal and his various friends in a natural world of unspoken rules and unimaginable consequences–and rightly so: they’re perfectly told tales from the knife blade of utter specificity and universal understanding. But contrarian that I am, I love Woodring’s dialogued comics even more so this book is a treasure for me. 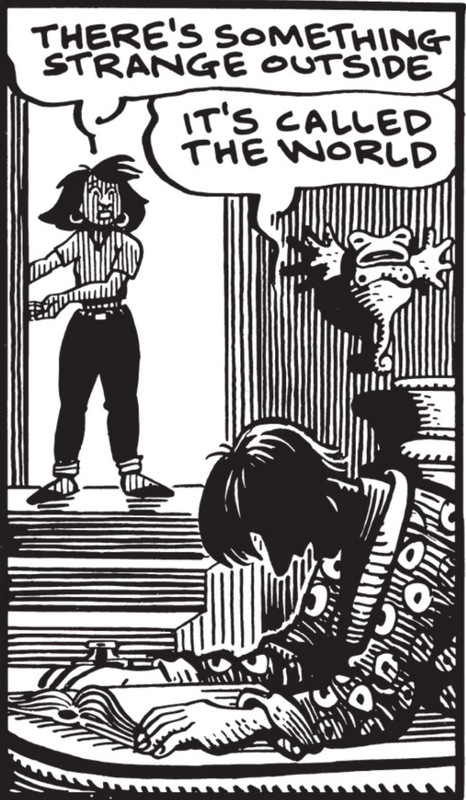 Like Crumb, Woodring has an alluringly organic line and an interest in the messier sides of the subconscious. But whereas Crumb’s work is obsessed with the event horizon where childishness twists into pubescent sexuality, Woodring usually oars into waters deceptively sedate. […] if I were finally able to get to the top of that winding, narrowing staircase hidden somewhere in the circular galleries of the hotel I have visited regularly in dreams from the past fifty years, and if I were to find nothing transcendent at the top of those stairs, I would be shattered. In fact I might never recover from such a shock. I’m not joking. 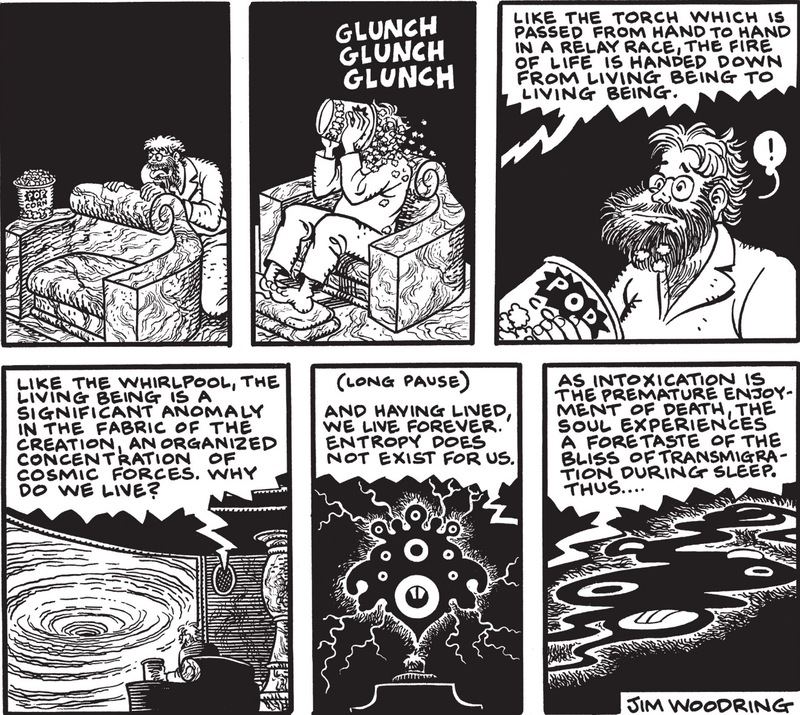 That unending journey up the staircase comprises the majority of the material here: the comic stories read like unlabeled dream journal entries, where Woodring as character moves from one scenario to the next, usually the strange rendered familiar in one scene, and the familiar made strange in the next. 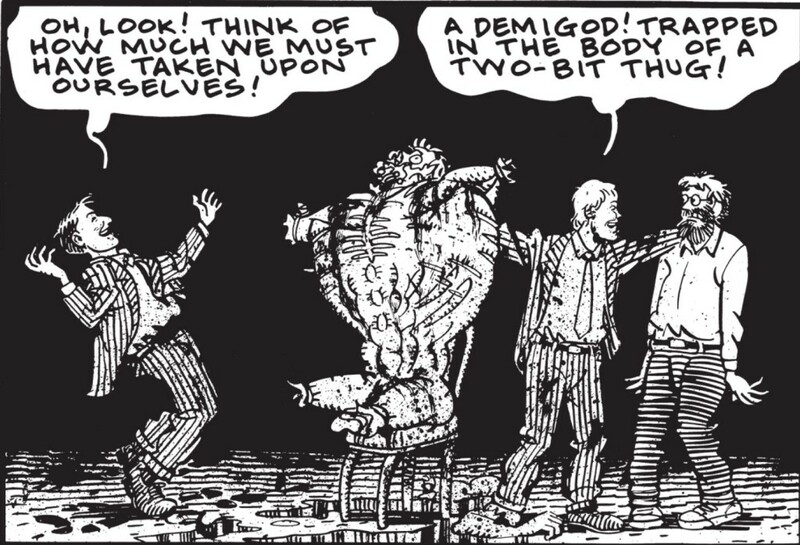 Transcendence is forever forthcoming, but only arrives at unexpected moments, then dissolves as Woodring or the characters around him break up in guffaws. 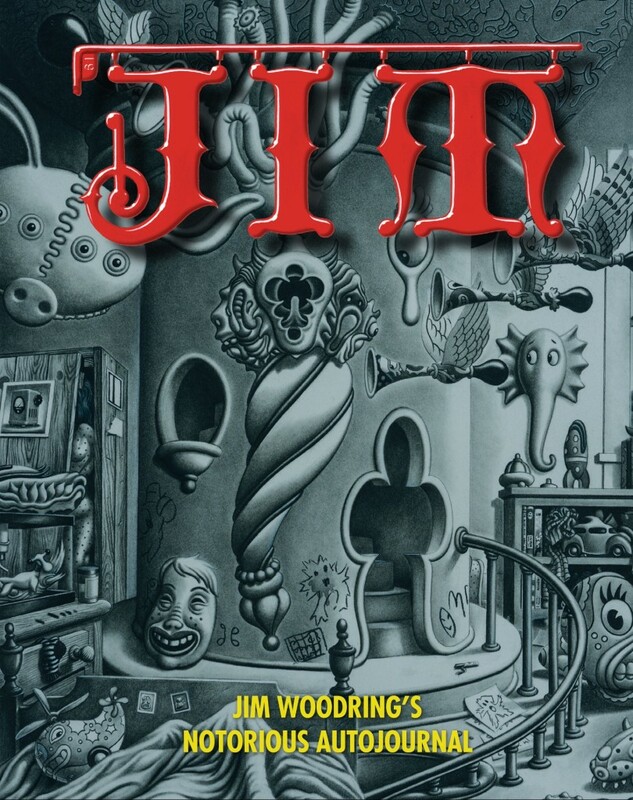 Like any good purveyor of the dreamworld, Woodring can marry parts of his subconscious to yours, such that fragments of his vision are never far from hand. I’ve had bits of these comics embedded in my brain like shrapnel for something like thirty years now. The digital collection isn’t perfect–the transition from painted color to printed black and white to digital doesn’t do a few pieces any favors, the reproduction of Woodring’s original zine is pretty hard on the eye, and two of the pages in “Obviously Not” (pgs. 172 and 173) are reversed, but I’ve been so grateful to have this right on hand, nearly everywhere I go. Strangely, but sincerely, grateful. If I Ruled The World: Jeff Ponders the Comixology 4.0 Rumors…. ← Because You Vaguely Approved Of It: More Capsule Reviews From Matt! James planned an 18 issue series but was cancelled at 6…..I’m not holding my breath on it coming BACK…Bionic Woman S4 at least got to finish its original storyline…Kuhoric hasn’t mentioned anything about it coming back since it was cancelled 9 months ago…. Really? Ugh, that would be kinda terrible if they didn’t wrap it up at all. Thanks for the info, but…man. Thank you, sgmf! I will take it, now matter how small it actually may be.